It is time to discover a new way of eating with a new recipe. I know it's got a funky ingredient, looks a bit strange, but trust me, it's good and uber healthy! 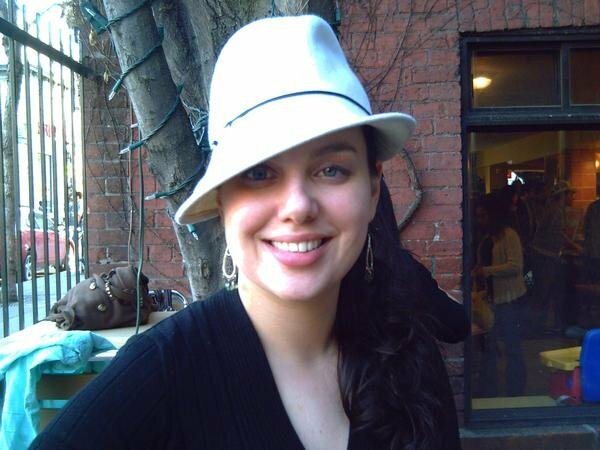 This is a throwback to my vegetarian/macrobiotic days. Yes, I have eaten in as many healthy ways as possible. I was eating at one of my old veggie restaurants and they had this wonderful seaweed salad, it was new to me but I like to keep my heart and soul young by having new experiences, so I went on a taste bud adventure. 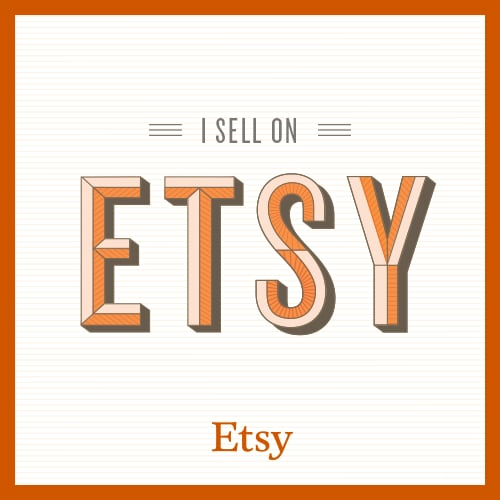 I went nuts and returned every day for a week to indulge in it because I could not get enough! Then I went back home and recreated a version of it with a bit less Tamari and the addition of carrots, it was perfect! 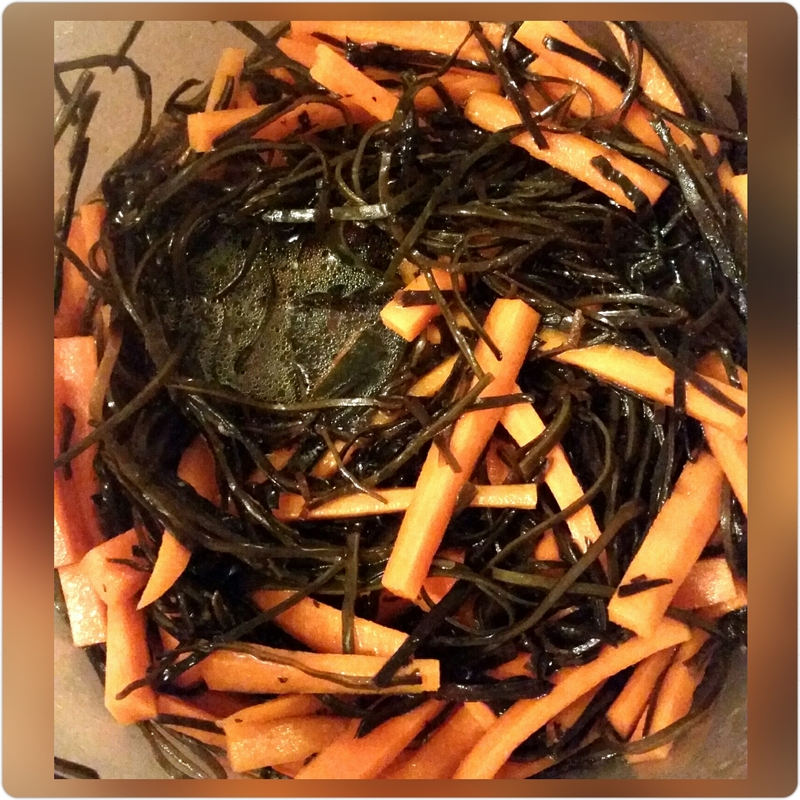 I discovered seaweed when I started researching the macrobiotic diet and reading some of Michio Kushi's books about it, along with Kristina Turner's guide. I had a bunch of other books on the subject and I grew to really appreciate the health benefits of this gift from the ocean. 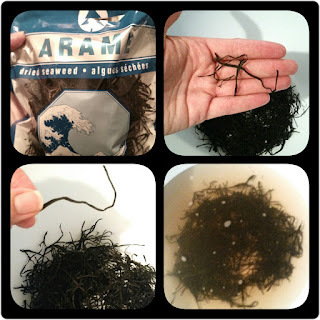 Here's a little background information on Arame, and if you are interested in Macrobiotic food, I am leaving links down below to help you explore. The recipe follows this short blurb, I really hope you are brave and try something new, this recipe has been a staple for 17 years now. Arame Sea Vegetable is a brown algae cultivated off the shores of Ise (ee-say) Bay, Japan where it thrives in cool waters of the arctic Japan current. The sea there is surrounded by National forests and mountains and is known as the 'Ocean by Mountains' area. Rivers nourish the bay adding to a mineral rich environment. This area leads all of Japan in ecology movements. 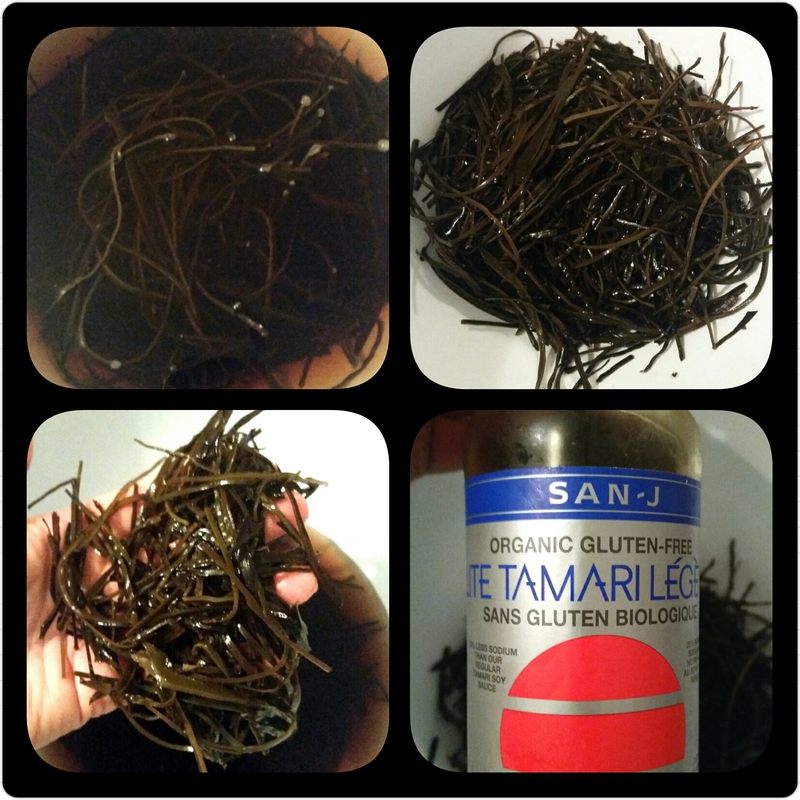 Development is forbidden to ensure future generations the legacy of this famous edible seaweed resource. Only the most tender fronds of arame are selected and hand harvested in the summer. The fronds are washed and sun dried. After drying, the fronds are then steamed for five hours to soften it and enhance its color, then finely shredded to make it easy to use and quick to prepare before naturally air drying. 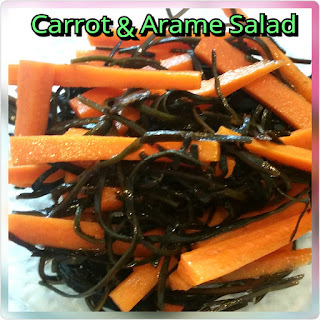 Arame has been a traditional part of the Japanese diet since ancient times. Eden Arame is low in sodium, low calorie, and fat and cholesterol free. It is a good source of magnesium and calcium. According to the FDA, "Low fat diets rich in fruits and vegetables (foods that are low in fat and may contain dietary fiber, Vitamin A, or Vitamin C) may reduce the risk of some types of cancer, a disease associated with many factors." Eden Arame is rich in dietary fiber and a good source of vitamin A. Also, "Diets low in sodium may reduce the risk of hypertension or high blood pressure, a disease associated with many factors." Arame is high in calcium, iodine, iron, magnesium, and vitamin A as well as being a dietary source of many other minerals. It also is harvested for alginate, fertilizer and iodide. It contains the storage polysaccharide laminarin and the tripeptide eisenin, a peptide with immunological activity. Lignan content in arame is noted by several sources. It also contains the phlorotannins phlorofucofuroeckol A, dioxinodehydroeckol, fucofuroeckol A, eckol, dieckol, triphloroethol A and 7-phloroethol. Extracts of this algae have been tested to combat MRSA staph infections. One of my fav. Macrobiotic books for those new to this lifestyle and diet, it is fun, you can write in it, and it gives a great breakdown with simple, nourishing recipes. This is another great primer for Macrobiotics by the founder of it all. -Prepare your carrots by cutting into medium sized matchsticks. The pictures below show the process of getting them that size. 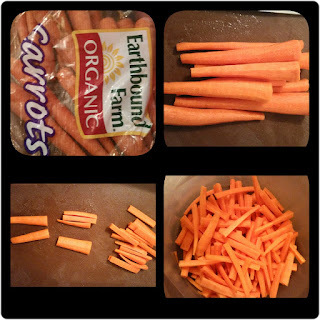 -Rinse carrots in cold water and lightly pat dry, reserve(keep aside), in a bowl. 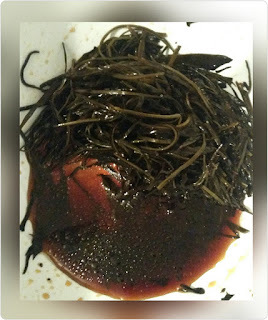 -Grab the bowl of Arame, you will notice it has softened and really expanded. Using a mesh strainer, strain and Rinse in cold water the Arame seaweed. 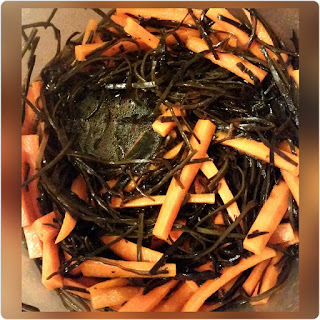 -Shake off excess water, gently mix the seaweed in with carrots. -Add sesame oil, vinegar, Tamari, and toss gently. -Cover and refrigerate for 2-4 hours. -Eat as is or as a side dish, this is a great accompaniment to more heavy foods but I love it so much that I usually eat it on its own. Enjoy, leave your comments below & don't forget to subscribe! 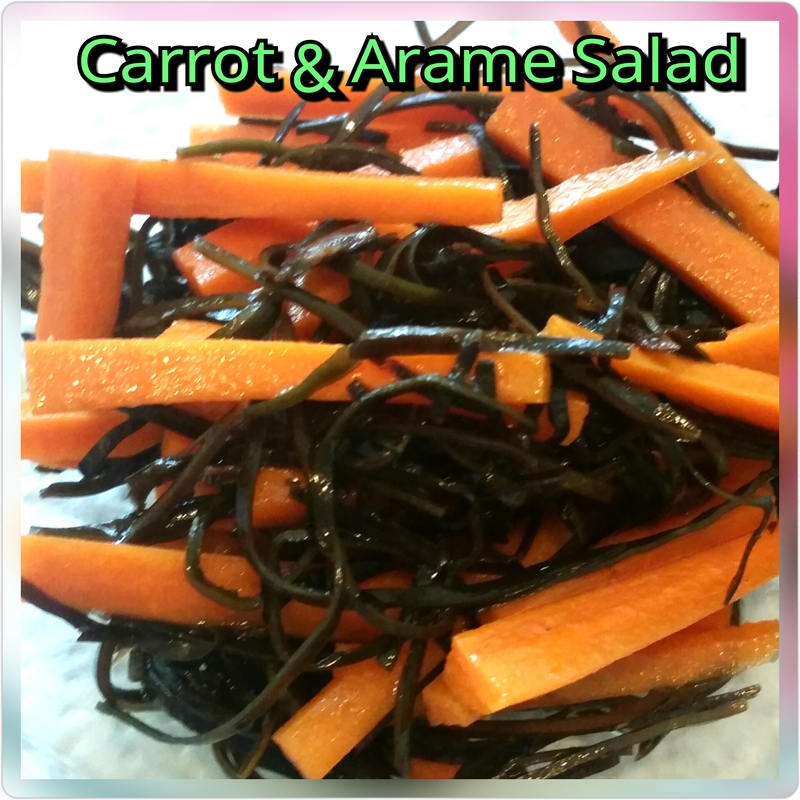 1 comment on "Carrot & Arame Salad"